Besides for printing PVC tape, Laro Tape can also help you out with printed paper tape. This is a paper packing tape with an adhesive layer based on natural rubber. 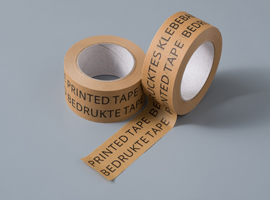 Paper tape gives your packaging a somewhat more natural and/or ecological look that may fit in well with your product. Naturally imprinted with your own company information and/or logo. Just like the other printed tape types of Laro Tape, printed paper tape is a cheap, simple, and extremely effective communication tool. Another, additional advantage is that you can tear off this tape by hand. Your products will get proper protection and it will make your business easier to identify during shipment. Request an offer now. Would you like to have more information? Please don't hesitate to contact us. Copyright ©2019 Laro Tape B.V.